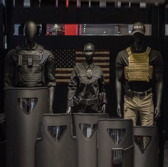 Safariland Group has produced a new lightweight ballistic shield using Honeywell‘s Spectra Shield ballistic-resistant composite material. Honeywell said Tuesday the newest product in Safariland’s X Series line of ballistic shields is designed to weigh up to 20 percent less than traditional ballistic handheld shields, which usually weigh more than 20 pounds. The X Series shield works to integrate the ballistic glass window directly into the shield through the Spectra technology to eliminate weak points associated with traditional frame systems, such as drill holes and seam lines. Spectra is built to provide 15 times more strength than steel while being light enough to float. The material has been used for various armor applications, including bullet-resistant vests, breast plates, helmets, combat vehicles and military aircraft, Honeywell noted. Safariland offers hard and soft armor products to law enforcement personnel worldwide.